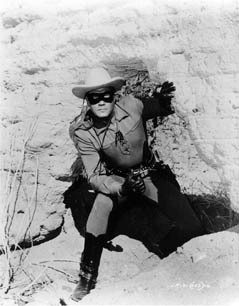 CLAYTON MOORE, THE LONE RANGER! Clayton on a U.S. Stamp! Silver Screen Legend XIII Opportunity Drawing! 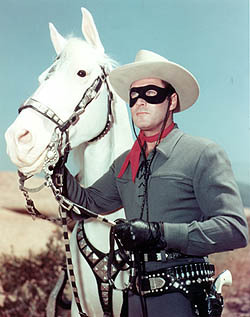 CLAYTON MOORE AS THE LONE RANGER RIDES AGAIN! Click on the above button to hear "Hi Yo Silver, Away"
"The Lone Ranger! "Hi Yo Silver!" A fiery horse with the speed of light, a cloud of dust and a hearty "Hi Yo Silver!" The Lone Ranger. "Hi Yo Silver, away!" 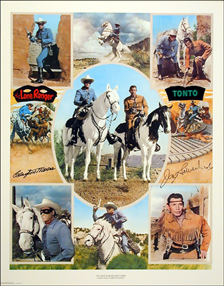 With his faithful Indian companion Tonto, the daring and resourceful masked rider of the plains, led the fight for law and order in the early west. Return with us now to those thrilling days of yesteryear. The Lone Ranger rides again! That all things change but truth, and that truth alone, lives on forever. In my Creator, my country, my fellow man."